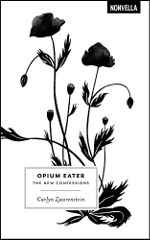 This book intertwines the author's own experiences taking opioids to control the pain from ankylosing spondylitis with a discussion of our current problems with opioid addiction and a look at the role of opioids in the Romantic period. The title is a reference to a book by Thomas De Quincey, a Romantic-period writer who wrote about his experiences with laudanum. Zwarenstein compares De Quincey's experiences with comments from online forums for present day opioid users and her own observations. She also discusses how the development of tolerance for the drug and the worries about addiction complicate the use of opioids to control chronic pain like hers, and considers how these processes played out in De Quincey's life as well as the lives of other famous opioid users. This is a thought-provoking and interesting book that also connects on an emotional level.